Introduction: Among the various causes of tooth discoloration after root canal treatment, percolation of sealer remnants into the dentinal tubules of the pulp chamber is the most common cause. Objectives: The aim of this study is to evaluate the efficacy of dentin bonding agent (DBA) in preventing coronal discoloration caused by four different root canal sealers- MTA Fillapex, Sealapex, Zical and Z. O. B seal at different time intervals by measuring chromatic alterations using digital images analysis method. Methodology: Ninety mandibular premolars were collected and sectioned at 1 mm below the cementoenamel junction. Standard access cavity preparations of dimensions (depth-3 mm, width-0.8 mm, and length-3 mm) were prepared with a No. 245 bur through the cervical access. Following the standard irrigation protocol, specimens were then randomly divided into nine groups (four groups without DBA [1–4] +4 groups with DBA [5–8] +1 negative control ). In Groups 1–4, four different root canal sealers (MTA Fillapex, Sealapex, Zical, and Z.O.B seal) were applied to the walls of the pulp chamber. For Groups 5–8, the samples were etched with 37% phosphoric acid and DBA application was done before the respective root canal sealer application. The cervical access in all specimens was sealed using glass ionomer cement. Digital photographs were taken under standard lighting and environmental conditions at different time intervals: preprocedural, postprocedural, and after 1, 2, 3, and 4 months. These images were analyzed using Adobe Photoshop CS6 from which laboratory values and subsequently Delta E values were obtained. Results: Statistical analysis performed using repeated measures ANOVA and post hoc Tukey's tests show that the groups with DBA application had significantly lower mean Delta E values (P < 0.05) compared to the groups without DBA application. Conclusion: DBAs applied to the dentinal walls of the pulp chamber before obturation can effectively reduce the sealer-induced coronal discoloration. Incomplete removal of root canal sealers from the pulp chamber on completion of root canal treatment has been attributed to be one of the major causes of single tooth discoloration. The chromophores resulting from the disintegration of root canal sealer remnants penetrate through the dentinal tubules into the coronal tooth structure gradually causing progressive discoloration. In the past, several in vitro studies ,,,,, have evaluated the coronal discoloration caused by various endodontics sealers. The risk of discoloration caused by root canal sealer remnants in the pulp chamber can be reduced either by its complete removal or by sealing the dentinal tubules thereby preventing its percolation. Various methods have been tested to remove the root canal sealer remnants from the pulp chamber; orange solvent, chloroform and xylene on a cotton pellet, solvents like formamide, 2-phenylethanol (Endosolv R) and 95% ethanol, isopropyl alcohol, 95% ethanol, acetone and amyl acetate solution  and dry cotton, chloroform, orange oil, eucalyptol, and ethanol. In routine endodontic practice, root canal sealer remnants are removed from the walls of the pulp chamber by rinsing with water and drying with a dry cotton pellet. However, complete removal of the root canal sealer remnants from the pulp chamber is often strenuous clinically , and sometimes remnants are present due to iatrogenic inadequate manipulations. The difficulty in removing the remnants using water or other solvents is attributed to the low solubility of root canal sealers in water and ethanol which might preclude their complete elimination from the pulp chamber. Based on the findings of Akbari et al. and Shokouhinejad et al., dentin bonding agent (DBA) applied to the dentinal walls of the access cavity can effectively seal the dentinal tubules and decrease the coronal discoloration caused by various endodontic cements., However, no in vitro study has evaluated the efficacy of DBA in preventing coronal discoloration caused by root canal sealer remnants, when applied to the dentinal walls of the pulp chamber before obturation. The aim of this in vitro study was to evaluate the efficacy of DBA in preventing coronal discoloration caused by four different root canal sealers- MTA Fillapex, Sealapex, Zical and Z. O. B seal at different time intervals by measuring chromatic alterations using digital images analysis method. With the power of study fixed as 80% and the level of significance set at P < 0.05, the required sample size was determined as ninety for nine groups. Human mandibular premolars which were extracted for orthodontic reasons from patients aging 20–30 years were collected, disinfected and stored in saline solution. The teeth were then sectioned in the coronal third of the root about 1 mm below the cementoenamel junction. The apical segments were discarded, and the coronal tooth structure was evaluated carefully and was screened based on the following inclusion and exclusion criteria. Middle-third of the buccal surface of the crown corresponding to A3 shade in a commercial shade guide VITAPAN ® classical shade guide (VITA Zahnfabrik H. Rauter GmbH and Co., KG, Bad Sackingen, Germany) using visual analysis method performed by the same operator. For standardization purpose, a No. 245 carbide bur was used to prepare the pulp chambers to a depth of 3 mm, the width of 0.8 mm and the length of 3 mm through cervical access. The internal walls of the pulp chamber were debrided gently with H Files No. 60–80. After final irrigation with 2.5% sodium hypochlorite and 17% ethylenediaminetetraacetic acid, the pulp chambers were dried with a sterile cotton pellet. The specimen were randomized into the following nine groups using simple random numbers generator  and were assigned into sequentially numbered airtight containers by a researcher who was blinded to the specific treatment planned for each group. Group 9–negative control group (neither sealer nor DBA). In Groups 1–4, equal quantity of a thin layer of respective root canal sealers according to their specific groups was applied to the walls of the pulp chamber in all the samples using a No. 45 spreader by the same researcher who was blinded to the type of sealer being applied. In Groups 5–8, the walls of the pulp chamber were etched using 37% phosphoric acid gel, Super Etch (SDI Ltd., Bayswater, Victoria, Australia). A single layer of Adper Single Bond 2 (3M/ESPE, St. Paul, MN, USA), a total etch visible-light activated dental bonding agent was then applied according to the manufacturer's instructions prior to the respective root canal sealer application by following the same protocol used for the Groups 1–4. A sterile small cotton pellet was placed in the chamber, and the cervical access in all specimens was sealed using glass ionomer cement (GC FUJI IX GP, GC Corporation, Tokyo, Japan). The specimen were all labeled and stored in saline in separate airtight containers. Digital images were recorded during the following time intervals: preprocedural (tb), postprocedural (t0), after 1 month (t1), 2 months (t2), 3 months (t3), and 4 months (t4). The representative images showing digital images taken during preprocedural (tb), postprocedural (t0), after 1 month (t1) and 4 months (t4) are depicted in [Figure 1]. 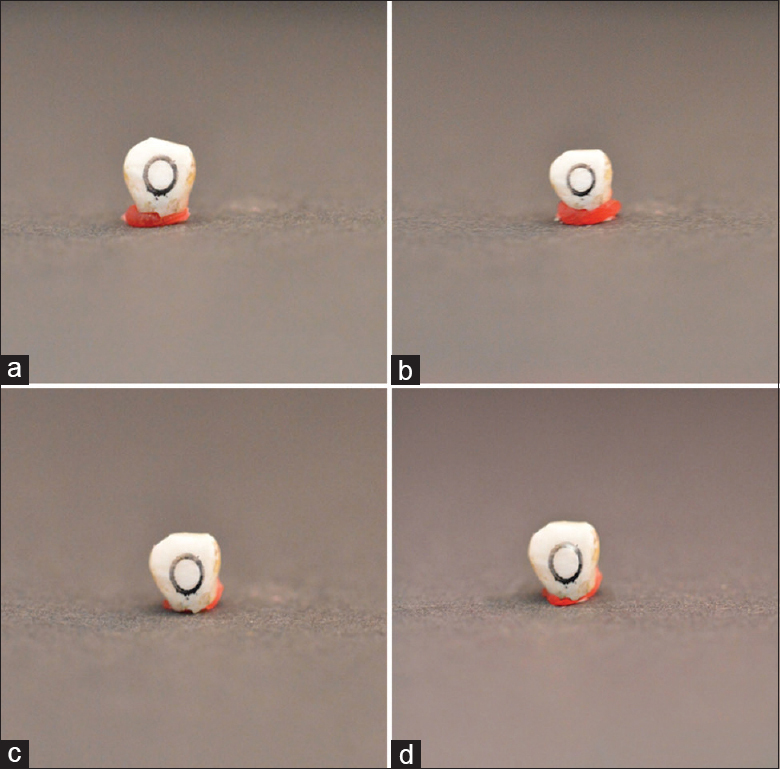 For reproducible color assessment, a circle of diameter 3 mm was drawn on the middle third of the buccal surface of the crown using waterproof ink. All the digital photographs were recorded under standard desiccation and lighting conditions by the same operator who was blinded to the group to which the specimen belonged. A PhotoBox (SSL 100– Photo studio in a box, Inspiron) was used to standardize the lighting conditions. Images were captured using a high-resolution digital camera (Canon EOS 450D, 12.2 MP; Canon Inc., Tokyo, Japan) kept at a standard distance of 25 mm from the object in RAW file format with a 100-mm macrolens (Canon EF 100mm F2.8 macro USM) under standardized conditions (exposure: 1/200 s, Aperture: F/22; white balance flash: 5500 Ko)., Images were imported into Adobe Photoshop CS6 for shade analysis within the CIE L*a*b* color space. Color measurements were performed thrice inside the marked circle, and the mean value was calculated and recorded. Digital photographs and color measurements were taken under standard conditions at the following different time intervals: Tb-preprocedural, t0-postprocedural, t1-after 1 month, t2-2 months, t3-3 months and t4-4 months. The color change (Delta E) between the baseline (tb) and other time intervals t0, t1, t2, t3, and t4 were calculated using the following formula and Delta Eb, Delta E1, Delta E2, Delta E3 and Delta E4 were obtained. Delta E*ab= ([L*a - L*b] 2+ [A*a - A*b] 2+ [B*a - B*b] 2) 1/2, in which L* indicates the value of lightness-darkness, a* indicates greenness-redness, and b* indicates blueness-yellowness. The difference between two colors in an L*a*b* color space is measured in terms of Delta E.
Statistical analysis was done using Repeated measures ANOVA (mixed model) followed by post hoc Tukey's test. The mean Delta E values for different groups at different time intervals are illustrated in Line Graph [Figure 2]. Mauchly's Test of Sphericity [Table 1] indicated that the assumption of sphericity had been violated, χ2 (9) =17.64, P = 0.040 and therefore, a Greenhouse-Geisser correction was used. A repeated measure ANOVA determined the difference in mean Delta E values differed statistically significant between assessment stages (preprocedural, postprocedural, after 1 month, 2 months, 3 months, and 4 months) (F (3.609, 292.303) =1291.074, P < 0.0001) and is illustrated in [Table 2]. This also shows that an overall significant difference in means exists, but to know which specific means differed, a post hoc test was required. 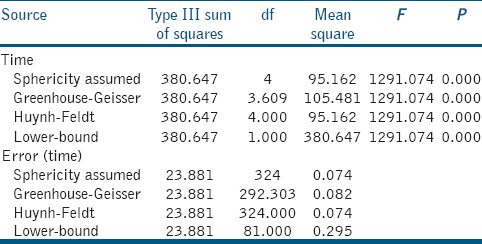 Results based on post hoc Tukey's multiple comparisons between groups are concised and are depicted in [Table 3] which shows that the groups with DBA application (Groups 5–8) had significantly lower mean Delta E values (P < 0.05) compared to the groups without DBA application (Groups 1–4). There was a statistically significant difference in mean Delta E values between the Groups without DBA application, and the results can be summarized as discoloration potential of Z. O. B seal > Zical > MTA Fillapex > Sealapex. However, there was no statistically significant difference in the mean Delta E values within the DBA groups.,,, Out of all the groups, the negative control group had the least mean Delta E value and the difference when compared to all the other groups was statistically significant. All root canal sealers can potentially stain tooth structure to varying degrees. This study aimed to assess the role of DBA in sealing the dentinal walls of the pulp chamber and thereby prevent coronal discoloration caused by root canal sealer remnants using digital images analysis method. The results of this study do not directly represent the in vivo tooth discoloration potential of root canal sealers in good clinical practice, because this in vitro investigation of the discoloration potential is based on the generation of a “worst case scenario” by leaving a significant even amount of sealer in direct contact with the axial dentinal walls of the pulp chamber. Like almost all the previous studies evaluating tooth discoloration caused by root canal sealers, this study also uses cervical access to deliver the sealer into the pulp chamber instead of coronal access ,, to standardize and use all the five dentinal walls, the buccal, lingual, mesial, distal including the roof of the pulp chamber. Similar to the previous research measuring discoloration induced by root canal sealers,,,, premolars crowns were used in the present study because of their voluminous pulp chambers compared to anterior teeth that allow bulk placement of sealers. Moreover, in this study, preparation of the walls of the pulp chamber to standard dimensions was done through cervical access to standardize the volume of the sealer applied. This is clinically relevant because ideally during access cavity preparation, the dentinal walls of the pulp chamber are mechanically prepared and therefore this simulates the clinical conditions closely. Although these premolar teeth are not representative of the anterior esthetic zone, the choice of the specific sample was correct, since the initial color of samples in all the groups were standardized. Various methods that have been implemented in the literature to measure root canal sealer induced color changes include visual technique, spectrophotometric evaluations, calorimeters and digital images analysis method. However, the spectrophotometric analysis remains the gold standard for color measurements, certain studies measuring coronal discoloration have used the digital images analysis method.,,, Cal et al. and Anand et al. compared digital and spectrophotometric methods for shade selection and concluded that they are reliable as the values obtained with the digital method correlated with those obtained using spectrophotometer., The advantages of digital images analysis method as compared to spectrophotometers or colorimeters is that it is cost effective, time-saving and convenient. The challenges faced while using digital images analysis method include the need to use a DSLR camera, developing a familiarity with the digital photo imaging software and maintaining a standard distance from the object, lighting, and environmental conditions. Factors that affect discoloration potential of root canal sealers include: (1) composition of individual root canal sealer, (2) quantity of sealer remnant in the pulp chamber, (3) composition of the tooth structure, (4) amount of remaining dentin thickness, (5) permeability of dentinal tubules, (6) translucency of enamel, and (7) inherent anatomy of the pulp chamber, presence of pulp horn crevices which might encourage sealer retention in the chamber. 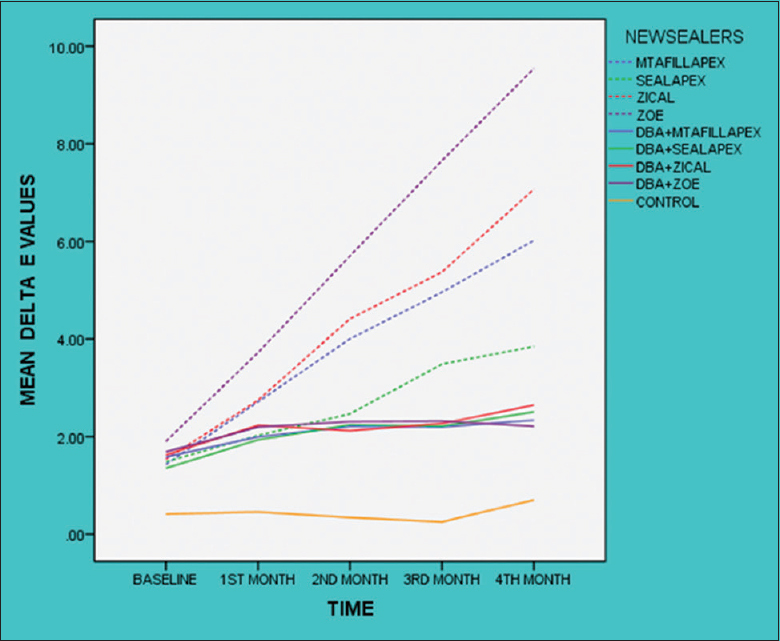 From the results of the present study based on the Multiple comparisons between the groups as depicted in [Table 3], it can be inferred that the groups with DBA application (Groups 5–8) had significantly lower mean Delta E values compared to the groups without DBA application (Groups 1–4). Therefore, an additional step of applying DBA protects the surface of dentinal walls by sealing the dentinal tubules and may reduce the interaction of sealers with the pulp chamber walls during the obturation procedure and thereby may reduce discoloration. Another finding in this study is that DBA could not prevent coronal discoloration completely, but it could effectively reduce the risk of coronal discoloration caused by root canal sealer remnants and lower the mean Delta E values to an average range 1–2, above which the color difference is considered clinically perceptible for in vitro studies. However, the reason why DBA could not prevent discoloration completely is not known. This finding is consistent with the previous research done by Shokouhinejad et al. and Kim et al., who evaluated the efficacy of DBA in preventing coronal discoloration caused by triple antibiotic paste., The bonding agent used in this research is Adper single bond 2, which is a total-etch adhesive system. Unlike self-etch adhesives, bond strength or microleakage evaluations of total-etch adhesives when used in multiple layers have not been substantiated in the literature. Therefore, a single coat was applied according to the manufacturer's instructions. The probable reason why DBA could not prevent the discoloration completely could be attributed to the single layer application of DBA used in the present study. Therefore, future research to test the potential of multiple layers of DBA to prevent sealer induced coronal discoloration completely is implied. 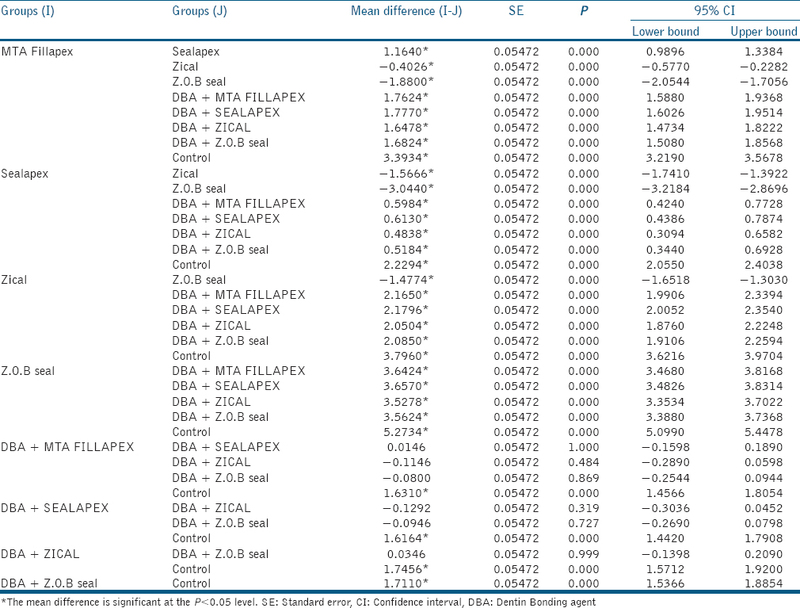 In the present study, multiple comparisons within the DBA groups [Table 3] shows that there was no statistically significant difference in mean Delta E values within the groups where DBA application was done prior to sealer application. This shows that DBA application may effectively reduce the discoloration rate irrespective of the type of sealer which can contaminate the pulp chamber. Application of DBA prior to obturation can effectively serve the following purposes: (1) prevents contamination of the dentinal walls of the chamber by sealer remnants thereby preventing discoloration, (2) During obturation, the bonded surface might be contaminated with sealer remnants or saliva. It can be easily decontaminated by rinsing, drying and re-application of another coat of DBA prior to access filling. Differences in the adhesive properties of root canal sealer remnants to the bonded surface may be expected due to variation in their chemical composition, the surface energy of the bonded surface, the surface tension of the sealer, wetting ability and the cleanliness of the bonded surface. In the present study based on the multiple comparisons within the sealer groups [Table 3] where no DBA was applied, it can be inferred that all root canal sealers tested potentially discolored tooth structure to varying degrees. Discoloration potential of the tested sealers can be summarized as Z. O. B seal > Zical > MTA Fillapex > Sealapex. This finding is consistent with previous research done Ioannidis K who compared MTA based sealers and Zinc oxide eugenol (ZnoE) based sealers and concluded that Roth 811, ZnoE-based sealer induced severe coronal discoloration in comparison with MTA Fillapex. The varied discoloration potential of the tested sealers is attributed to the compositional changes of the sealers. The sealers which contained ZnoE which are Z. O. B Seal and Zical showed greater discoloration compared to others probably due to the Free or even bound eugenol changes chemically (oxidizes) and darkened with time. Compared to Sealapex, MTA Fillapex showed greater discoloration potential which may be due to the fact that MTA Fillapex contains a trace amount of iron (0.0260 mg/kg) which has the potential of staining the tooth and bismuth oxide gets destabilized to bismuth carbonate which is light sensitive and results in tooth discoloration over a period. In the present study, coronal discoloration caused by root canal sealers progressed in a time-dependent manner consistent with the previous research.,, The reason for this might be due to the inherent composition of individual sealers, which undergo certain chemical change leading to discoloration and as the time progresses further chemical reaction and seepage of discolorants lead to more discoloration. Potential minor inaccuracies in standardization due to compositional changes of tooth structure in the pulp chamber in different samples. Routine application of DBA to the walls of the chamber as a preventive measure before commencing obturation may be recommended. So even minor traces of sealer remnants which are left behind accidentally during or after obturation might not cause coronal discoloration. Root canal sealer remnants regardless of their type cause intrinsic staining of teeth and the discoloration progresses in a time-dependent manner. DBAs applied to the dentinal walls of the pulp chamber before obturation can effectively reduce the sealer-induced coronal discoloration. Further in vivo studies are to be conducted to validate the results of this laboratory research. Partovi M, Al-Havvaz AH, Soleimani B.In vitro computer analysis of crown discolouration from commonly used endodontic sealers. Aust Endod J 2006;32:116-9. Ioannidis K, Mistakidis I, Beltes P, Karagiannis V. Spectrophotometric analysis of crown discoloration induced by MTA- and ZnOE-based sealers. J Appl Oral Sci 2013;21:138-44. El Sayed MA, Etemadi H. Coronal discoloration effect of three endodontic sealers: An in vitro spectrophotometric analysis. J Conserv Dent 2013;16:347-51. Ioannidis K, Beltes P, Lambrianidis T, Kapagiannidis D, Karagiannis V. Crown discoloration induced by endodontic sealers: Spectrophotometric measurement of commission international de I'eclairage's L*, a*, b* chromatic parameters. Oper Dent 2013;38:E1-12. Zarei M, Javidi M, Jafari M, Gharechahi M, Javidi P, Shayani Rad M, et al. Tooth discoloration resulting from a Nano zinc oxide-eugenol sealer. Iran Endod J 2017;12:74-7. Greenwall L, Freedman GA, Gordan VV, Haywood VB, Kelleher M, McLaughlin G, et al., editors. Bleaching Techniques in Restorative Dentistry: An Illustrated Guide. London: Martin Dunitz Ltd.; 2001. p. 160. Roberts S, Kim JR, Gu LS, Kim YK, Mitchell QM, Pashley DH, et al. The efficacy of different sealer removal protocols on bonding of self-etching adhesives to AH plus-contaminated dentin. J Endod 2009;35:563-7. Kuga MC, Faria G, Rossi MA, do Carmo Monteiro JC, Bonetti-Filho I, Berbert FL, et al. Persistence of epoxy-based sealer residues in dentin treated with different chemical removal protocols. Scanning 2013;35:17-21. Topçuoğlu HS, Demirbuga S, Pala K, Cayabatmaz M, Topçuoğlu G. The bond strength of adhesive resins to AH plus contaminated dentin cleaned by various gutta-percha solvents. Scanning 2015;37:138-44. Schäfer E, Zandbiglari T. Solubility of root-canal sealers in water and artificial saliva. Int Endod J 2003;36:660-9. Akbari M, Rouhani A, Samiee S, Jafarzadeh H. Effect of dentin bonding agent on the prevention of tooth discoloration produced by mineral trioxide aggregate. Int J Dent 2012;2012:563203. Shokouhinejad N, Khoshkhounejad M, Alikhasi M, Bagheri P, Camilleri J. Prevention of coronal discoloration induced by regenerative endodontic treatment in an ex vivo model. Clin Oral Investig 2018;22:1725-31. Statrek. Available from: http://www.stattrek.com/statistics/random-number-generator.aspx. [Last accessed on 2018 Mar 08]. Wee AG, Lindsey DT, Kuo S, Johnston WM. Color accuracy of commercial digital cameras for use in dentistry. Dent Mater 2006;22:553-9. Felman D, Parashos P. Coronal tooth discoloration and white mineral trioxide aggregate. J Endod 2013;39:484-7. Forghani M, Gharechahi M, Karimpour S.In vitro evaluation of tooth discolouration induced by mineral trioxide aggregate fillapex and iRoot SP endodontic sealers. Aust Endod J 2016;42:99-103. Zare Jahromi M, Navabi AA, Ekhtiari M. Comparing coronal discoloration between AH26 and ZOE sealers. Iran Endod J 2011;6:146-9. Thomson AD, Athanassiadis B, Kahler B, Walsh L. Tooth discolouration: Staining effects of various sealers and medicaments. Aust Endod J 2012;38:2-9. Cal E, Güneri P, Kose T. Comparison of digital and spectrophotometric measurements of colour shade guides. J Oral Rehabil 2006;33:221-8. Anand D, Kumar GP, Anand DY, Sundar MK, Sharma R, Gaurav A. Shade selection: Spectrophotometer vs. digital camera – A comparative in vitro study. Ann Prosthod Restor Dent 2016;2:73-8. Miyajiwala JS, Kheur MG, Patankar AH, Lakha TA. Comparison of photographic and conventional methods for tooth shade selection: A clinical evaluation. J Indian Prosthodont Soc 2017;17:273-81. Gupta R, Kumari RA, Meena N, Sharma H, Murthy CS, Vikram. Coronal discoloration induced by three different endodontic sealers: An in vitro sectrophotometric analysis. Int J Oral Health Med Res 2016;2:48-50.